Livestock and cattle operations can produce very high levels of ammonia and hydrogen sulfide. Nitrogen in food sources produces ammonia and hydrogen sulfide gases during digestion that is released into the air by livestock as the food passes through excretion. These gases cause an obvious unpleasant odor and can also lead to health problems and physical damage to animals, adversely affecting overall livestock production. •	Reduced Gain Rates – Pig gain rates can be reduced by 12% with ammonia exposure at 50ppm and by 30% with ammonia exposure at 100-150ppm. •	Lesions/Abscesses – Tracheal and nasal lesions in pigs have been reported with ammonia exposure at 100-150ppm. •	Respiratory Diseases – Pigs and turkeys have exhibited a reduced ability to clear their lungs of bacteria with ammonia exposure at 50-70ppm. •	Excessive Mucous Production – Turkeys with ammonia exposure as low as 10ppm showed unhealthy mucous production after just 7 weeks. •	Increased Condemnation Rates – Even ammonia exposure at just 10-15ppm can reduce a pig’s resistance to infection, giving way to potentially life-threatening livestock illnesses. •	Pungent Odors - Odors from livestock facilities can be a sore subject for rural communities because residents not connected to livestock operations are often bothered by odors that interfere with their daily activities. •	Safety Risks – Hydrogen sulfide is produced when organic matter (such as animal waste) breaks down and is then released into the ground. This hydrogen sulfide can then contaminate drinking water, raising public health concerns. •	Environmental Implications – Global warming and volcanic eruptions are the leading cause of hydrogen sulfide accumulation worldwide, but livestock excretions are also contributing to rising levels of hydrogen sulfide. High levels of hydrogen sulfide can cause sickness and eventual death in humans, animals and plants. In fact, geoscientists have concluded that over 250 million years ago unusually high hydrogen sulfide levels in the oceans and earth’s atmosphere led to the most wide-scale mass extinction in the earth’s history. 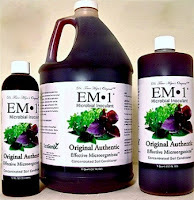 EM•1® Microbial Inoculant uses beneficial microbes- creating an antioxidant effect to naturally break down and eliminate ammonia odor as well as decrease hydrogen sulfide putrefaction. In fact, some poultry houses using EM•1® have eliminated ammonia gases entirely (with an average reported ammonia level of 5-6ppm after use). Due to increased production resulting from lower ammonia and hydrogen sulfide levels, livestock operations can generate profits up to three times higher than the cost of using EM•1®. EM•1® microbial inoculant solutions can be used for dairy cattle foot baths, manure treatment, to wash down milking parlors, sprayed on pastures, and even applied directly to the animals themselves to keep skin and hides healthy. To read more, please visit our livestock solutions page. If you have been following the news lately, you know that it’s not always easy to practice healthy living . In the last two years incidents of salmonella have been on the rise, prompting recalls of tomatoes, jalapenos, peanut butter, sprouts, lettuce, eggs, and most recently, ground turkey. Last week CBS News revealed that the Cargill ground turkey recall includes 36 million pounds and 32 different varieties of ground turkey (including popular labels like Honeysuckle, HEB brand, Safeway, and Kroger). If you regularly eat ground turkey you should be aware of the signs of salmonella poisoning and know what precautions you should take to avoid getting sick. These salmonella poisoning symptoms usually come on within 72 hours of being infected. In most cases, people suffering from salmonella poisoning are able to recover without needing to seek medical attention, but in rare cases it can spread into the bloodstream or bones, killing patients with weakened immune systems. If any of the above symptoms last longer than 7 days or stools are bloody you should consult a doctor immediately. Meat should be refrigerated within 2 hours of purchasing it (or 1 hour in the summertime). Where possible, shop for meat at the end of your grocery trip so it’s not sitting in your cart for a prolonged period of time. In the summer car temperatures can reach well over 100 degrees. Once in your car turn on air conditioning to cool down the inside of your car. When cooking make sure you know what internal temperature is safe for the egg or meat dish you are cooking and then use a meat thermometer to determine when it’s done. Do not just rely on color, as this can lead to unsafe meat being served and consumed. 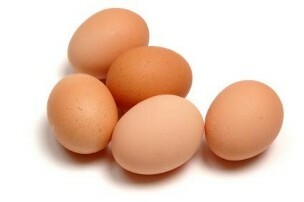 After handling raw meat or eggs be sure to wash your hands, work surfaces, and utensils with soap and hot water. Additionally, disinfect work surfaces with a bleach solution where possible. When reheating food make sure that the internal temperature reaches the safe cooking temperature before consuming the leftover food. Dish cloths and sponges can be a breeding ground for salmonella and other dangerous forms of bacteria. Make sure that dish clothes are washed regularly and sponges are thrown out when they start to get old. When thawing meat always thaw it in the fridge, not on a countertop. Leaving meat at room temperature is very dangerous. When you move the meat from the freezer to the fridge to thaw make sure you put it in a bowl so that a leak doesn’t contaminate other items in the fridge- especially foods that will be eaten raw, like vegetables. For more tips on healthy living, including probiotics for digestive and immune system health, tips for combating chemicals sensitivities, and maintaining a home free of harmful chemicals, visit Teraganix online.